To register for online access, please contact our Customer Service Department by visiting our Administrative Headquarters at 13G Red Gate Road, George Town, Grand Cayman or 96 Cross Road, West End, Cayman Brac. View our corporate location map here. info@waterauthority.ky or call the number listed below. Please note that, at this time, only owners may register for online account access. 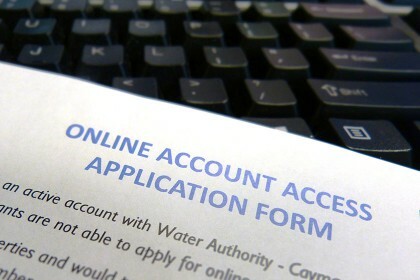 If you are an owner with multiple accounts and wish to access all your accounts together online, please make a record of the account numbers and have them available to complete your application.